Indigenous in southwest Colombia are terrified after finding six unidentified bodies in an area where multiple armed groups are vying for control over territory abandoned by FARC guerrillas. The bodies were found on Friday by indigenous guards in Suarez, a former stronghold of the FARC, which demobilized 12,000 people earlier this year. In an unrelated incident, a military unit was attacked with explosives on Saturday in Toribio, a municipality some 30 miles east of the massacre. Two soldiers were injured in the incident, regional indigenous organization ACIN said. 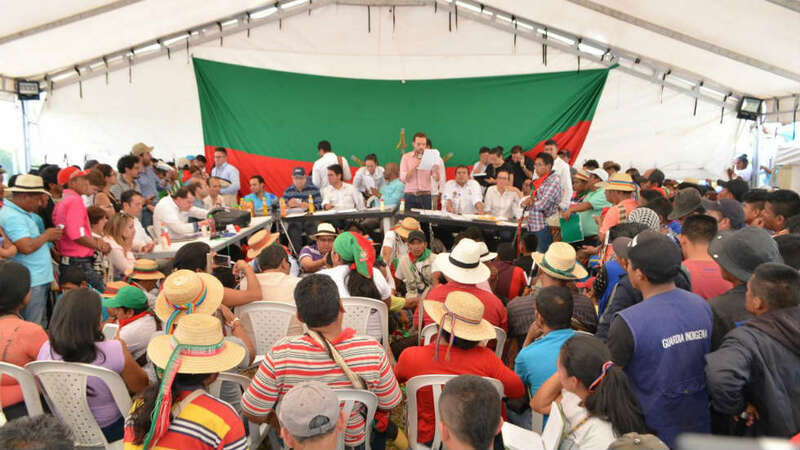 The indigenous organization said the massacre took place amid armed confrontations between guerrillas of the ELN and the EPL, which has incorporated dissident FARC guerrillas in the region. More than 250 families from rural communities in Suarez have fled their homes after the massacre and the alleged resurgence of armed conflict. The ACIN said locals were forced to temporarily flee after the attack on the military unit that injured two soldiers, but were able to return after the situation had stabilized. The Suarez massacre is the third in three months in areas in southwest Colombia that is of major importance to illegal armed groups because of regional dependence on coca, the base ingredient for cocaine. Both areas are priority areas in the peace process that has been marred by the killing of social leaders and drug-related violence. The ACIN called on the national government and the international community to protect the local communities. We continue making an urgent call to the international community about the human rights situation affecting the people of northern Cauca. The security forces have been criticized for failing to provide public security or other basic state services in former FARC territory. Indigenous groups in the region have been affected by armed conflict in the mostly lawless region for decades.